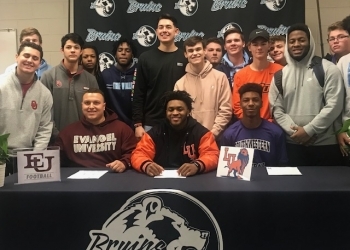 National Signing Day is all over, and three Bartlesville High Bruins put pen to paper to continue their career at the next level on Wednesday. Bruin running back DeAndre Young signed to play at Langston. Wide receiver Gerald Gray signed with Southwestern College in Winfield, Kansas. And offensive lineman Keaton Harris signed at Evangel University. Bartlesville head football coach Jason Sport says those three guys should serve as a guide for younger players on the team. Two of the three Bruins that signed on Wednesday were in their first year with the program. Gray had not played football until this past season, and Harris was a transfer from Dewey High. Bartlesville will return the majority of its starters in 2019, the first under Sport as head coach.